The Federal Reserve doesn’t have a strategy; not really. It’s wandering in the dark. It is, more or less, like a chef, who has served diners a special meal, not sure if they would like it. Since the courses were free, up until now, the clients were happy to eat anything, even if they were getting full (who says NO to free food), but the chef is now charging for his meals, and it’s the moment of truth for him – will customers walk-out or will they stay, regardless? The chef is the Federal Reserve, which has lowered interest rates to zero and even negative real levels (free meals), so diners (investors), bought stocks, no matter how expensive they were (like the diners kept eating, even when full). After customers were served their free desserts, the chef started charging for meals (like the FED began tightening), which makes investors think more carefully about buying equities (like the picky diners, who need to watch their wallets and bellies, starting now). When taking into account the real total returns on stocks, not including any price appreciation, today’s number is HIGHER than what bonds offer. Stocks still offer 5.4%, on average, even if their price stays the same. 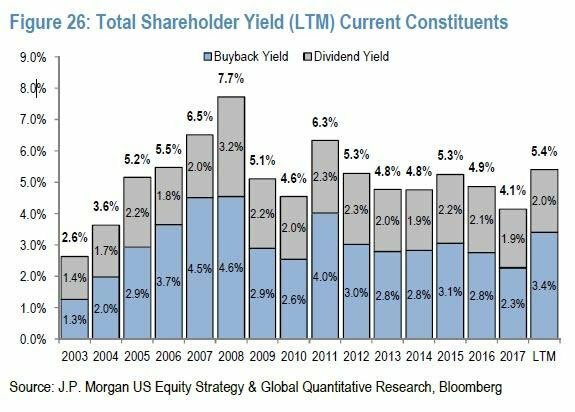 Buybacks and dividends combine for this 5.4% total return. That’s not astronomical, but, as you can see, it’s pretty healthy. The third component to this equation is how much the investing community feels stocks are worth. If their outlook is negative, then this positive 5.4% will be offset by lower valuations, as multiples collapse. If these sell-off are greater than 5.4%, we will experience another RED year. The Federal Reserve can influence investors’ sentiment, by taking the right course of action, like signaling that they will accommodate by lowering rates when it’s appropriate, or, vice versa, tighten rates when that is the right choice. The predicament that they’re currently in is impossible, since the market is already pricing-in cuts and the end of tightening, even though the bank hasn’t officially made the announcement. If they tighten, the market will be shocked – not good. If they pause (not raising, nor cutting), to check the pulse of the market, they risk getting behind it again, as has happened in December. If they cut rates, which is what the market believes they will do, then the FED, basically, admits that a recession is on our doorstep. It has painted itself into a corner. 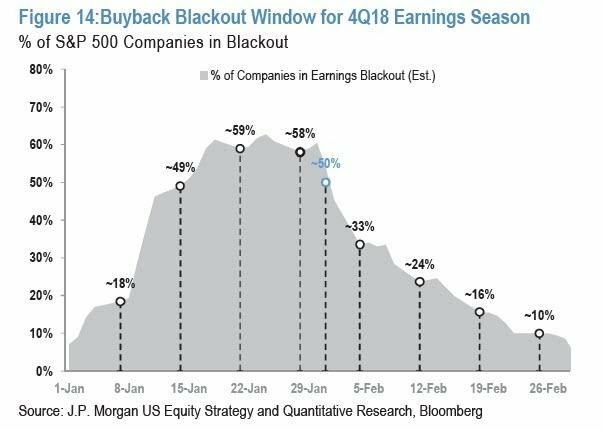 Because it is earnings season, some 300 companies, out of 500 in the index, can’t buy back shares, at the moment. It’s blackout period. Obviously, when this restriction is lifted, more demand for shares will resume, but as I said, it might not be enough, if the FED makes policy mistakes. The bottom line, which is that the reason that the USD is really stuck with its back against the wall, is because all recessions officially begin after the central bank cuts rates for the first time after a tightening cycle. Three weeks ago, I showed you why gold would only confirm a bull market, when the FED cuts rates, and the reason is that it is the best telltale sign the recession is upon us. The red line, which inverts prior to each recession, is important, since it confirms that we’re headed for rough waters. That’s where we’re at today – nearing a yield inversion. 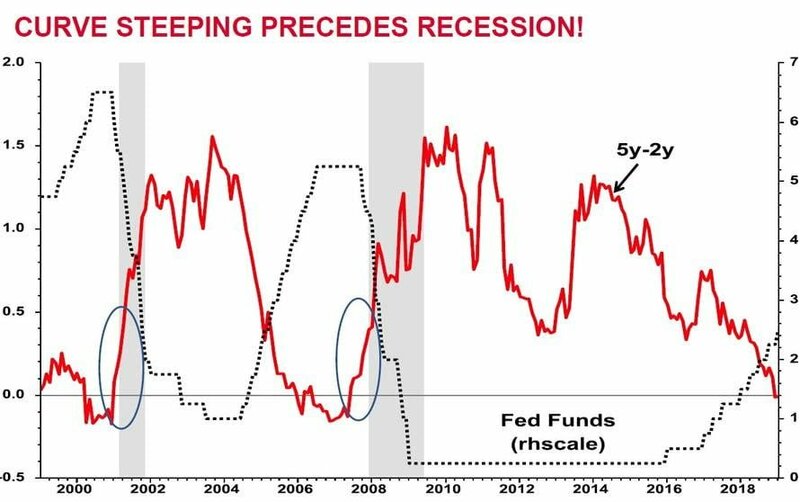 But, as you can see, once the FED cuts rates, to allow the yield curve to broaden again, recession follows immediately after. Gold at $10/Ounce in the Ground!